The lifestyle video category is broad and contains many interesting subcategories, from cooking to beauty tips to fashion to celebrity content. Because of this, women can be motivated to watch lifestyle videos for a number of different reasons. 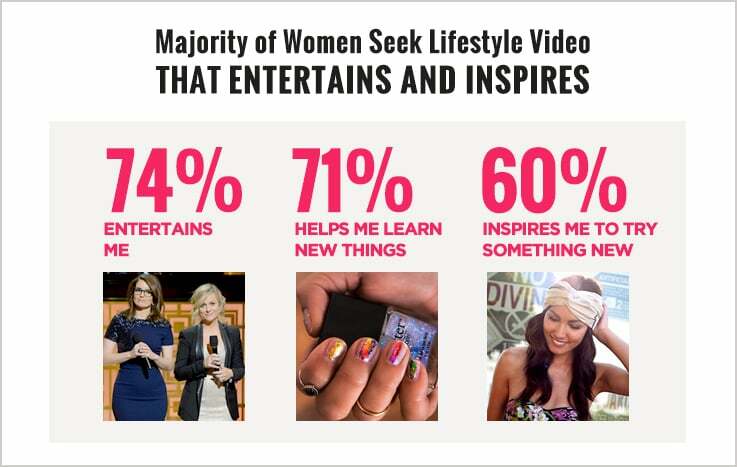 As part of the POPSUGAR Insights/ulive 2014 lifestyle video study, we asked women to rate the reasons why they watch and enjoy lifestyle video content. Women are seeking videos that genuinely try to educate; offer interesting, informative content; and motivate them to take action. Nearly three-quarters of women say that lifestyle video content entertains them (74%), helps them learn new things (71%), and inspires them to try something new (60%). Lifestyle videos can drive women to take action in their lives. Women say that lifestyle videos inspire them in general (56%), provoke thought or knowledge (54%), stoke a passion because they are about something that they're passionate about (53%), broaden their horizons (53%), and motivate women to perform the activity that was shown in the video (52%). Lifestyle videos don't always have to be educational and inspirational. Sixty-seven percent of women say they watch lifestyle videos to help pass time, and another 59% admit that they're just fun to watch. Fifty-four percent of women watch lifestyle videos because they make them feel happy, 52% say they help them feel relaxed, and 49% admit that lifestyle videos help them escape the real world.